and thank you all for your loyalty and support. May all your dreams come true for 2010. THE LOVEDAY CONSPIRACY has been nominated for the Christmas Award on the red roses for authors website. This is your chance to vote for me. ind.sole@yahoo.co.uk click here to vote. This is a great website for lovers of contemporary and historical romance with regular reviews and author interviews. It is always exciting when a novel comes out in a new format and many Loveday fans enjoy the audio version of the novels. Here is good news for them. The audio version of THE LOVEDAY CONSPIRACY is out today. It is published by Isis Soundings and would make a great Christmas present for anyone who prefers to listen to stories. If purchased through the Isis Soundings website it is approximately half the price of Amazon. 12 Cassettes boxed set £21.99. CD set £31.99. MP3 CD £31.99. Other titles in the series are also available.I love the cover presented by Isis. 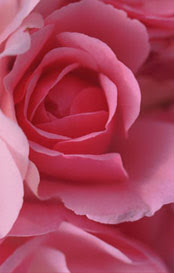 This is a fabulous review for THE LOVEDAY CONSPIRACY from the review website redrosesforauthors.blogspot.com. It is a great site for readers of romance. 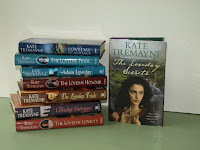 From the master storyteller, Kate Tremayne, comes a new episode in her epic tale of the Loveday family. Anyone who has read any of Tremayne's powerful Cornish sagas will have eagerly awaited this latest. Tristan, the outcast, grandson of a rogue and despised by his superior cousins, now has the upper hand. Because of Adam Loveday's twin's perfidy, the home Adam adores – Trevowan Manor - now belongs to his hated cousin and his twin brother is in his grave. Adam thirsts for revenge, while all Tristan wants is to be accepted by the proud family who once threw him back into the gutter from whence he came. Yet he too dabbles in things that may lead him into danger.Adam and Japhet, his more favoured cousin, both have enemies and they meet regularly to practise their deadly skills so that when the time comes they will be able to engage and kill their foe. However, as the twisting tale of love, hate and revenge winds on, a very different fate awaits the cousins. Caught up with French spies and the rescue of a beautiful lady, they may find themselves temporarily on the same side. Tremayne skilfully juggles a large cast of characters, each with their own enthralling story, keeping the reader eagerly turning the page and although the book reaches a satisfactory conclusion, we know that this tale does not end here. This quarrelsome, powerful family will continue to delight and engross thousands of readers for a while yet.This author deserves a bouquet of red roses for her wonderful sagas. THE LOVEDAY CONSPIRACY has been in the Amazon Historical bestseller lists for SEVEN WEEKS. For some of the time it was also joined by THE LOVEDAY SECRETS. The excitement just keeps mounting. For those who missed the new extract from Conspiracy that I had posted on Historical Romance UK blog. For new readers this is the story background in the earlier books of the series - Japhet Loveday was falsely accused of highway robbery by Sir Pettigrew Osgood, found guilty and transported to th enew penal colony at Sydney Cove. He is now back in England and wants revenge. His cousin Adam also wants revenge on the man he blames for his twin’s death. Are you feeling all adrift? Don't feel like the Lady of Challot sailing to your doom. Cheer yourself up. On 1st November I posted a different extract from THE LOVEDAY CONSPIRACY from what appears on my website or this blog. It is on the historical romance UK blog so click on the link above to read. It has been an exciting week with the publication of the paperback of THE LOVEDAY CONSPIRACY and a special thank you to the readers who contacted me saying how much they enjoyed the hardback edition. Such emails always give me a boost when I am struggling with the current work in progress and the plot seems to be flagging. They make me dig deeper and some of the memorable scenes from the series have been created after receiving such emails. I thought my readers would like to know that in their own way they do become part of the Loveday creation. When writing the Loveday novels it is important to me that I involve the characters in the more commonplace historical events that are happening at the time. In the earlier books following on from the revolution France had been at war with England since 1793 and Adam was involved in working for the British government rescuing our agents, and sailors from French prisons. He also helped French émigrés flee their country and was involved in sea battles. In 1799 Napoleon was elected First Consul and in 1801 he had set up a dazzling court at the Tuileries. At this time there was a strong Royalist movement in both France and England to restore Louis XVIII to the throne. Much has been written about the major battles and lives of the leaders involved but how an individual copes during a crisis brings a freshness to any given historical event. At the time The Loveday Conspiracy was set, 1802, England and France were enjoying a short truce. The English nobility and gentility flocked to Paris and it was a period of great merriment. However I suspect suspicion would still have been running high between both countrymen. This was the perfect time for Adam and Japhet to track down Sir Percy Osgood who was believed to be a double-agent. It would also have been plausible that Lady Alys would also be seeking to prove that her husband was not a traitor as she could safely travel to France at this time. Yet the truce was fragile. Within France were many dissenters and Napoleon was far from popular. He was promoting members of his family to high positions of power that more worthy men resented. To secure his place as First Consul he needed more victories and he was also planning to make himself Emperor. After the years of bloody terror when the guillotine had eradicated the monarchy and their followers, the people of France did not want to replace the ancien regime with another potentially corrupt one. In 1803 the end of the truce with England was sudden with Napoleon amassing a fleet at Boulogne to invade England. Fortunately most of the foreign visitors had fled the country, those who remained were being seized and detained by Napoleon, and it is into this situation our family have to fight for their lives. A few months after Japhet, Adam and Tristan escaped France. Napoleon crowned himself Emperor and a new reign of war spread across Europe. Just browsed Amazon and found that THE LOVEDAY CONSPIRACY was 13 in the Historical Titles Top 100. Wednesday Update. One day to publication day for The Loveday Conspiracy paperback and this morning it was rated 7 in the Amazon Historical Top 10. Thank you readers for all your support. 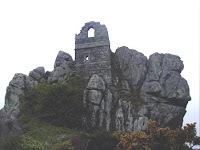 This is a picture of the hermit chapel at Roche in Cornwall which was a ruin at the time that a scene in The Loveday Conspiracy was set. Just two weeks to go before 29th October when the paperback of The Loveday Conspiracy is launched and Adam and Japhet sail into another great adventure. 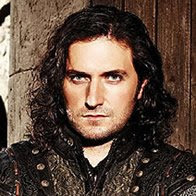 Hi All, today I am blogging on UK Historical Romance site. Click on the above link to read the post. Ramblings on the joys of writing!!! In a previous post Marilyn posed some questions which I am belatedly getting round to answering. I hope you find them interesting. 1. Which authors inspire you? Ans. I love mystery and suspense novels as well as historical. My favourite author is Barbara Erskine who has all these elements in her wonderful books. Daphne du Maurier always inspires. Katharine and Green Darkness by Anya Seton have been read several times. Gone with the Wind by Margaret Mitchell is another favourite and Here Be Dragons and The Sunne in Splendour by Sharon Penman; also Legacy by Susan Kay have pride of place on my shelves. Phillippa Gregory always gives an interesting twist to history. The Da Vinci Code and Angels and Demons by Dan Brown could never be left out of such a list. When in need of a good thriller I always enjoy Harlan Coben and Karen Rose. Last but by no means least, for a truly memorable read I have great admiration for Jodi Picoult. She will truly tug the heart strings and should be on everyone's reading list. 2. How much research do you have to do for each Loveday book? Ans. I read everything I can about the Georgian period and apart from rereading several of these to check certain facts usually add another 6-8 new ones for each novel. 3. What with research and writing, do you have time to read recreationally? Ans.I read two or three fiction novels a week mostly chosen from the writers listed above. Or any book in any genre that has been recommended to me. 4. Are you a disciplined writer? Ans. To be published you have to be disciplined it is your work, but when the muse refuses to strike its OK to take some time out. Then I usually read or watch a film and sometimes find that by doing this an answer is given to me. 5. Are there days when you DO NOT feel like writing? If so, how do you get back on track? Ans. Writing is a passion if not an obsession with me and no day feels complete if I have not produced some writing. There are however days when the Lovedays do not co-operate which often means I am tackling a scene or conflict from the wrong angle. 6. Has a Loveday plot or character ever come to you through a dream? Ans. Yes but not nearly often enough to make writing easy for me. Most of the prologues in the books have been dreams. 7. Do you keep a notebook of ideas for the future? Ans. Occasionally but usually they would only be relevant for future scenes in the current novel I am working on. 8. If you weren't the successful writer that you are, what would you most like to do? Ans. Be an unsuccessful writer. It is in the blood. 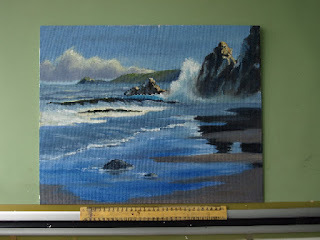 Although I would give more time to my art as I relax by painting wildlife and landscapes. Just dropping in to say I shall be updating the blog in a couple of days. I have been away on a weeks drawing and painting course set in fabulous gardens with peacocks parading in their majesty. The roof of the studio is glass and you can be completely lost in concentration and suddenly there is a great thump and a peacock patrols back and forth above us causing great distraction. They are beautiful and can be forgiven for their incessant loud cries from dawn to dusk. I have always found that my painting, which takes so much concentration at the time, then frees up the ideas for my current writing to come rushing in. I therefore return home with a batch of paintings and sketches with frantic scribblings for some new Loveday action on the back. The last couple of days I have been catching up with answering emails and making sense of my scrawlings to insert into the plotline. 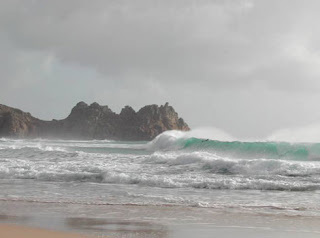 The school summer holidays have started and as we live only a short walk from the beach we returned to find phone messages from two sets of relatives asking to descend on us for two days in the week. One cousin from Montana I have not seen for several years so I am looking forward to it. I have been writing furiously all day on the new book. I clearly produce more when working to a tight schedule. The paperback proofs arrive next week for checking for The Loveday Conspiracy. That lot should keep me out of mischief. It is from the Prologue of THE LOVEDAY CONSPIRACY which foreshadows events to come that again engage Adam and Japhet Loveday in political intrigue. Amid such derring do there is not one but two strong romances woven through the story. A flame snaked across the cracked flagstones and as it sizzled along the fuse to the top of the powder keg, the Captain and four of his crew covered their faces with their arms. Each gulped a lungful of air, their bodies braced. There was a blast of heat. Then orange flames momentarily lit the dungeon. The impact of the explosion flung the men back against the wall, scalding the breath from their bodies. A shower of debris and dust billowed around them, stinging their throats and nostrils. With hearts pounding louder than a blacksmith’s anvil, they waited, peering through the clearing smoke. The thick oak door hung crookedly on its hinges. Behind it in the black pit that was the prisoner’s cell cries of terror and coughing was silenced by a shout. Men with their features hidden beneath matted beards and sores staggered out. Most wore some degree of naval attire, which had been reduced to rags. Despite the cold all had been stripped of their jackets and boots, the officers as dishevelled as the deck hands. 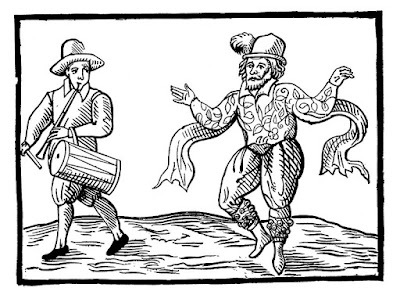 A few civilians also staggered out with their silk or fine cambric shirts in tatters around bruised and whip lashed bodies; the colour of their torn breeches indistinguishable after months of laying on filthy straw and rats’ droppings. They were a motley group weakened by dysentery and starvation rations. ‘There is no time to loose.’ The captain ordered. He was shocked at their condition. Some seemed barely able to walk. He could not tell if any were wounded or incapacitated by infirmity or age. There were more prisoners than he expected and it was his duty to save not only the English prisoners of war, but also any Frenchman who faced the guillotine because of his birth. From his hasty inspection some could barely stand and were unlikely to make the short dash through the port to the long boat. ‘God praise you!’ Voices greeted them. The strongest had pushed their way to the front and these were given the spare daggers and cudgels the Captain’s men had been able to carry. ‘Help each the wounded where you can, but once the fighting starts it will be every man for himself.’ It was not a decision the Captain wanted to make but too much depended on them getting quickly away or he could lose his ship and many more lives would be in peril. Two of his men helped support the wound. The Captain seeing the terrified face of a youth not much older than is eldest son, who was clinging to the wall for support, hooked the lad over his shoulder. With his sword raised, he stepped over the two bodies of the guards, each with their throats cut. Their greatest danger was the steps to the entrance of the lockup. If the sentries came hurtling down them both prisoners and rescuers would be trapped. They could all die. The Captain breathed easier that no alarm had so far been raised, but the explosion would have alerted the guards on the city walls. They would have only a few minutes to escape unless his accomplice Monsieur Grande had created a diversion in the town. Halfway up the steps he smelt the first taint of smoke in the air. As he flung open the door to the courtyard an orange glow lit the sky behind the quay. The thud of running men and shouts raised in panic were headed away from them. The fire that had been set was next to the grain store and if that burnt town, the citizens would endure a winter facing starvation. ‘Keep to the shadows!’ The captain warned the prisoners. He stood at the doorway urging those lagging behind to catch up with the others. He also glanced anxiously along the quay. Lord Grande must not be far behind them. There were only two long boats to row out to their brigantine and he could not afford to wait long for his accomplice to board. Yet without him the rescue would have failed. ‘Hurry my friend,’ he groaned as he sped after the prisoners. The outcry and frenzy in the town had drawn many of the sailors from the quayside taverns, but there would still be some placed on watch on each vessel. In times of war every furtive move was regarded as suspicious. Up ahead there was the sound of a scuffle and of a shot being fired. The Captain could just make out the first of the prisoners climbing down the stone quay steps to a long boat. Others were fighting. This could be disastrous. The Captain felt his blood freeze. From out of a tavern a dozen soldiers appeared, half of them carrying muskets. Their officer had raised his sword aloft and was rallying more to his side. The Captain drew his own pistol and fired at the officer, who went down, shot through an eye socket. ‘At them men! For England and King George!’ The Captain shouted. He was now in the thick of the skirmish and laying about him with his sword. He was slowed by the weight of the youth who also hampered his movements. A volley of musket fire brought down more prisoners but then it would take the soldiers over a minute to reload and some prisoners charged them wielding cudgels against muskets now used as clubs. There was little moonlight but the glow from the fire not only lit up the sky it was reflected in the water of the harbour. Only fifty yards separated them from the long boat. ‘Give me the boy.’ A white-haired prisoner took the youth from the captain. …There was a deathly hush. ‘And did they escape?’ A young voice demanded. Today I have posted an extract from THE LOVEDAY CONSPIRACY on ukhistoricalromance blog. Click on top of page. Adore them or loathe them where would we be without them. Our characters. The Lovedays frequently drive me crazy when they do their own thing and change the plot entirely. Yet that is positive as a novel is created through action and reaction. In the new work in progress I have a different dilemma. The story has moved on to Bryn (Adam's ward) searching to discover his past when his memory returns and the adventures that follow. He is easy to deal with. But it also features Rowena the oldest of the Loveday children. She is the image of her mother, the scheming fortune-huntress Meriel shown on the cover here. She has her mother's cunning and beauty and from her father has inherited the reckless spirit of the Loveday men. But who is her father. She naturaly believes it is St John who married Meriel but there has always been a question mark hanging over her paternity as at the same time as St John, Adam was also Meriel's lover. The personality of her father is also her guiding force. St John adored Rowena and could refuse her nothing. She was spoilt and her wilful nature has put her at odds with her family. When I began writing her story in the latest novel, I had real problems with her until I realised that actually I did not like this spoilt selfish brat. Major crisis here as she was to be the main heroine in the story and the reader must have empathy with her or they will lose interest in the story. I could make Meriel transparently evil as she was a secondary character and fed upon the weaknesses of others. This would not work with her daughter. Putting my own prejudices aside and aware of Rowena's troubled childhood - abandoned by her mother, her devastation at the death of her father and feeling betrayed by him for the loss of her home and security - it was obvious that by the time she became a young woman she would be a complex character with many emotional issues to be resolved. She is also wily and secretive and to make her work as a character readers will want to succeed, I spent a week doing a complex character profile and realised that the only way Rowena would work was to allow the reader into her head in a very different way than I have used before. It is still in its experimental stage in the writing and like all early drafts it will either work or its back to the drawing board. I do sometimes feel that today's teenagers are an alien race who dance to a completely different drum to their parents. Although the rules for them in Rowena's time were much stricter than today and the consequences far more dire if they were cast out of their homes, they faced the same problems we all did as teenagers in trying to find our way and hopefully achieve success without too much trauma. I am hoping that readers will see in Rowena every generations need to break free and be true to themselves and that her story will truly be one that transcends time. Calling all Loveday fans! Feel free to jump in and recommend actors for the roles of the leading characters. I am fascinated by the interesting suggestions. Don't be shy. There are NO wrong answers! Marilyn S who is a regular contributor to the Loveday blog posted the above following our fun and interesting weekend participation in picking stars to play Loveday characters. I thought it deserved a second slot. Love to hear your comments. Hope you like the pics of Richard Armitage and Rupert Penry-Jones. We've also had Chris Pine(the new Capt Kirk)nominated as Adam and the lovely Johnny Depp who could play a multi-role as all the Loveday men as far as I am concerned. Two very different covers here for The Loveday Secrets. The hardback cover with the woman's full face and gorgeous moorland scene behind is an image of Georganna. The poignant story of hers and Thomas's unusual marriage and the consequences that arise have a dramatic effect on all the family. The paperback with only a partial view of a woman's face is now the new look for the series so you definitely have to decide who you think fits this role. The new look has had a very positve response from booksellers. What do the readers think? More on the women on the covers again now. THE LOVEDAY PRIDE is one of my favourites as I love the colours and it has a Cornish seascape behind it. It could be Gwen as she features strongly in this one. It could be Bridie as she is yet to appear on a cover. It could even by Hannah who is still challenging Harry Sawle at great danger to herself. However I personally would have her as the more mature Senara now very much a cultured woman who has not lost her affinity with those less fortunate than herself. 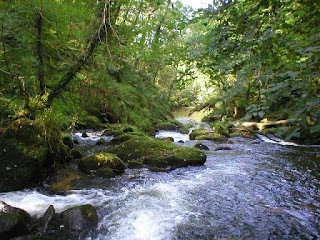 Also the moon over the water links in with her pagan upbringing and her strong ties to nature. What are your ideads on this? I'd love to hear from you. THE LOVEDAY REVENGE shows Felicity and her involvement with the family. She is very much a more feminine influence in this darker story of retribution and bringing the smuggler Sawle to justice. I love the colours of this dramatic background. 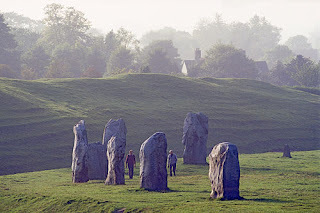 Today I am blogging on historical romance uk click on top of page for this article. I was away with the faeries when I put up the post yesterday as I am sure readers will realise that Honour and Loyalty were books 5 and 6 in the series. I have been checking the printer's proofs for Conspiracy this week (a rush turnaround as it will be published at the end of June) so have been overworking the brain cells. Book 3 The Loveday Trials was the odd cover out as it shows a tine mine and was chosen as an evocative Cornish scene instead of a woman. 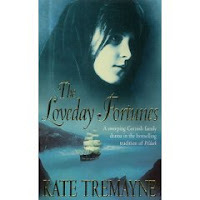 THE LOVEDAY HONOUR is one of my favourite covers and I think it really depicts the feisty and free-spirited Tamasine. After the briefest of appearance in The Loveday Trials she arrives dramatically into the family's life as Edward Loveday's love-child, whose existence had been kept secret from him. Tamasine was unstoppable in her quest for adventure and discovering such exciting relatives. Her story was a joy to write and the heartbreak of her first ill-fated romance the most poignant. The covers shows her as I had pictured her and I loved the atmospheric skyscrape and its colours. 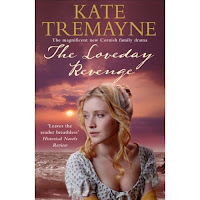 THE LOVEDAY LOYALTY continues Tamasine's story and also brings more to the fore Hannah and her struggle to run her late husband's farm and raise her children. She is in direct conflict with Harry Sawle, the ruthless and unprincipled smuggler but he finds he has met his match in her. The cover shows Hannah as a self-possessed and capable woman, her passionate nature bridled and now channelled into protecting her own. Are these the women you thought they were? First of all happy St Georges Day to all my readers and for any outside of the UK who do not know the significence of this day St George is our patron saint. The 23rd April also commemorates Shakespear's birthday and was also the date of his death. My great love of history and patronism always made we wonder why we did not as a country do more to celebrate this day. Was it luck or coincidence, if there is any such thing as coincidence, that my own special way of celebration was for that day to mark the birth of my daughter Alison and son Stuart. Although both were born on the 23rd Apri, their births were two years apart. Happy birthday to them and anyone else who shares the day with them. Marilyn asked me recently to reveal the identities of the Loveday women on the book covers. This is a question I have been asked many times. At first I always left it that as readers get very fixed ideas of what each character would look like, it was best for them to decide. I shall give you my idea and would be interested if readers agree or disagree. Today I will deal with the latest cover of Adam Loveday, Fortunes and Scandals. The beautiful blonde on Adam Loveday shows a woman of great determination and capable of manipulating men for her own ends. It is Meriel Sawle. The image on Fortunes is linked with nature and the sea and shows a woman self-assured but more mysterious. There is still a lot more of character to be revealed through later books. It is Senara. The image on Scandals has to be Gwendolyn. A woman breaking free of her family restraints and prepared to risk all for the man she loves. A woman who is idealistic and has yet to face greater challenges to come. 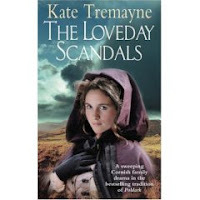 This beautiful, informative glossy magazine has a double page spread on Kate Tremayne and her Cornish series of historical novels about the Loveday family. I am really thrilled with this coverage and interview which talks about my love of Cornwall and how it has influenced my writing. 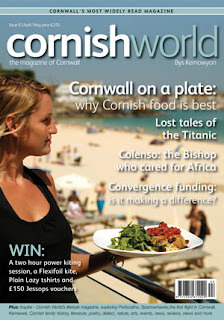 I enjoy this magazine which is full of interesting articles and pictures of Cornwall. Great news for all fans who have been unable to get a copy of THE LOVEDAY TRIALS. It is being reprinted and will be available next month. The Loveday Trials is the third book in the series. DO WE LEAD OUR CHARACTERS OR DO THEY LEAD US? 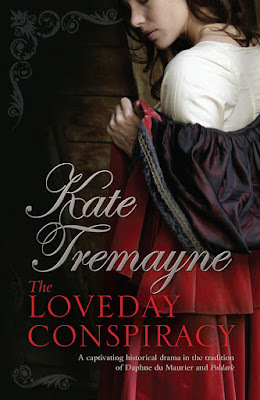 This is the fabulous new cover for The Loveday Conspiracy. It was a constant inspiration to make the story as dramatic and emotive as possible. It will be published in hardback in June and paperback in October. I have just delivered THE LOVEDAY CONSPIRACY to my editor and it has been my most challenging novel in the series. Throughout the books the themes have been multi-faceted and there was more than one conspiracy the family were involved in. One male thought he could outwit the women’s moral outrage at his conduct only to find that when they band together they are formidable opponents. Both Adam and Japhet Loveday have their own plots to bring an enemy to heel, and when they work together to serve their country in a conspiracy to bring a traitor to justice, they discover their own lives are in danger. As with all intricate plots the drama must be kept tense and the high action plausible at all times. The unfolding of the story is carefully choreographed and the characters given their motivation to act out the events on the page. Yet in the heat of the plot with emotions from the characters running high, do we strictly adhere to the storyline we have created, or do we allow our characters to dictate their next move. I believe that if you know your characters as well as you know your best friends they follow the necessary plan mapped out for them. However, like even best friends, there can be a hidden agenda they had not previously shown to us, or a side of their nature they had kept firmly in check until circumstances bring it bursting forth. With the wild blood governing the emotions of the Loveday men, the unexpected is always possible. The dramatic conclusion of the final conspiracy in this novel was fast paced and action packed. Then suddenly without warning the characters are no longer acting out the scenes as I had intended. They interceded to mould the events in their own irrepressible fashion. All the time I tried valiantly to keep them on track, the scenes did not work to my satisfaction, and with the deadline looming this was very stressful. One morning they just took over. For most of the last three chapters I had to sit back at the end of my writing day dominated by the shock of how they had reacted, yet knowing that this was the only course that they would have taken. What emerged was an even more suspenseful and a greater page-turner. The price I paid for this was I was left each evening in a state of semi-panic thinking ‘how do I get them out of that scenario?’ and also keep everything plausible and achieve a satisfactory and inevitable conclusion for the reader. The Lovedays had literally dictated how they would have reacted to the danger they faced, which was far more emotive that all my careful plotting and I knew I had to follow their lead. That is the joy of our writing and the challenge. It was also amazing how after several sleepless nights how little I had to edit previous chapters for the resolution to be exactly right for an exciting and unexpected ending. I believe most of our writing is done on a deeply subconscious level, the depths of which even we as the writer are not always aware. I also announce that following our exciting invitation to contribute to the Risky Regencies blog that the winner of my competition was Pamela Bolton-Holifield. I receive emails from all over the world saying that fans sometimes have trouble finding the Loveday books in shops or online. The good news for you in that the UK online company THE BOOK DEPOSITORY not only discount the Loveday books but worldwide postage is free. They give a prompt and efficient service. On Saturday THE WESTERN MORNING NEWS is running an article about me and the Loveday Books and how I get my inspiration. The Loveday Secrets should also be reviewed. Hope you enjoy it. I am delighted that finally I have got the Loveday blog linked to my website. I would love this to be fully interactive with lots of questions and comments from readers. You do not have to have a blog account to make a comment. Click on the comments and you can type in your name as some readers have done already. Tell us about your favourite characters and scenes. At the moment I am writing the final scenes for the LOVEDAY CONSPIRACY and the next book will jump a few years and start the adventures and romances of the next generation. Any of your thoughts on this will be interesting. I would like to thank all of you who emailled me having read Secrets and many said it was your favourite so far. Keep the emails coming. They inspire and uplift me often when I need it most.